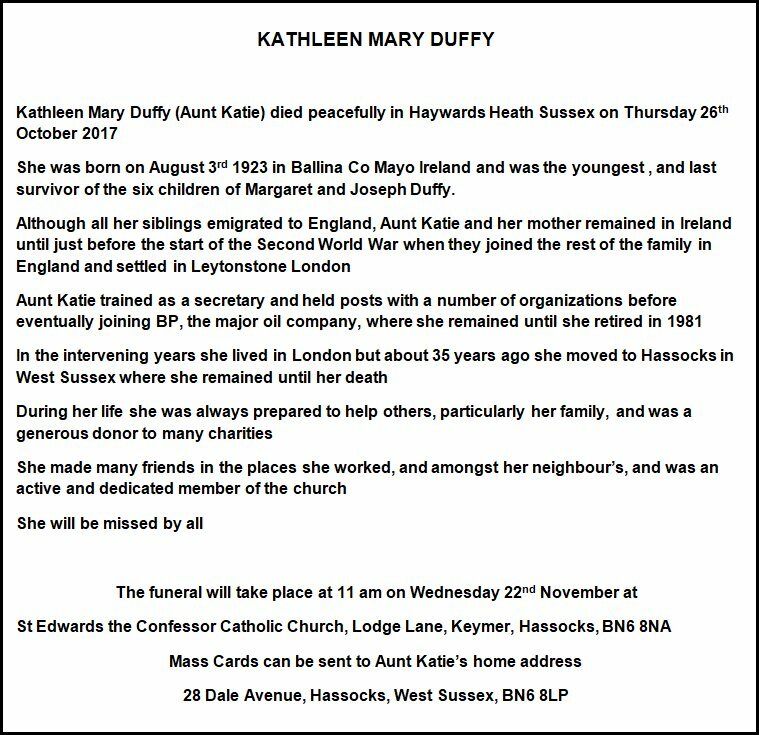 It is with sadness that I report the death of Kathleen Duffy on October 26, 2017, from complications caused by pneumonia. Although she lived to the age of 94, her sudden sickness and death still caught me by surprise. When I spoke with her on her birthday last August she still sounded strong and clear of mind. 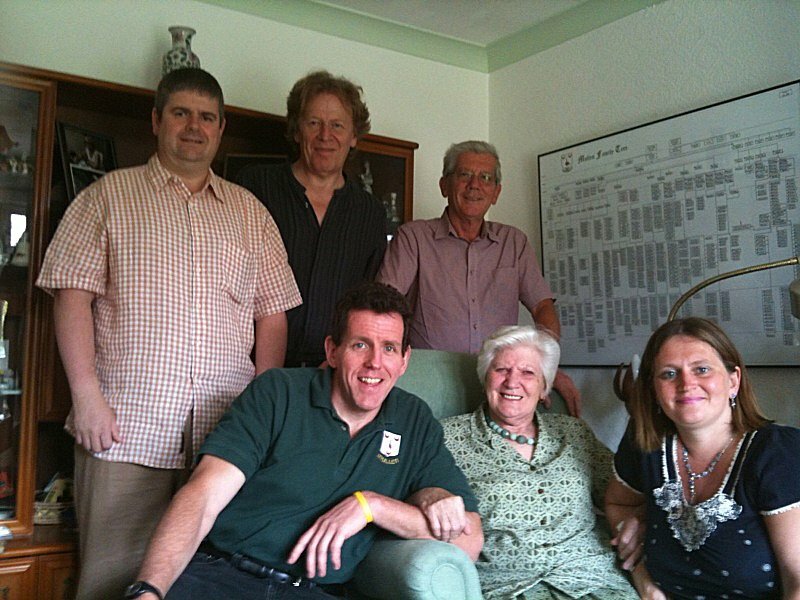 Her obituary, written by her nephews Patrick Mills (standing, center, in the photo above) and Brian Fowler (standing, upper right) can be found here. From a genealogical perspective, Kathleen Duffy was my third cousin once removed, but from every other perspective she was much closer than that. I first "met" Kathleen back in 2005 after my first visit to Ireland. During that visit my interest in genealogy was fueled by a meeting in Ballina with Vince Duffy who showed me a large family tree that had been put together by his late father (Sean Duffy) and his father's cousin (Madge Messenger). When I returned to the States, I sent a packet of information to Madge describing my interest in genealogy and asking for her help. A few months later, though, that packet was returned to me unopened with a note stating that it had never been claimed. I decided to send the packet to Madge's sister, Kathleen Duffy, who called me at my home a week or so later. She informed me that Madge's health had deteriorated to the point that she could no longer participate in detailed genealogical discussions, but that she would help me if she could. This phone call initiated a friendship between us that would last until Kathleen's unexpected death. In early 2006 I began to organize a reunion of the extended Mullen Family in Ballina. Kathleen was overjoyed when she heard of this. She stated that she was battling a number of physical ailments but that she would try her best to be there. I told her that I completely understood if she could not attend and mentioned that my Aunt Mary (a year older than Kathleen) was facing a similar dilemma. A day or two later I received an email from Kathleen. Embedded within was a note that Kathleen asked me to forward to Aunt Mary, a woman that Kathleen had never even met! 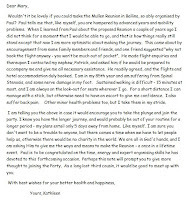 Click on the image on the right and take a minute or two to read this note. It will provide you with a small inkling of Kathleen's unique personality and her ability to connect with others. Ultimately, Aunt Mary's illness prevented her from attending the Reunion and meeting Kathleen. Still, Kathleen would often ask me about Aunt Mary in her emails. 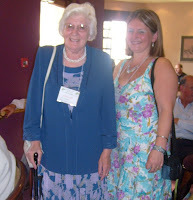 Kathleen and I finally met face-to-face at the Mullen Reunion in Ballina in 2008. While that event was, in many ways, a tremendous success, I didn't spend as much time as I would have liked with Kathleen. Thankfully, my extended family had a chance to talk with her at length, and she made a deep and lasting impression on them -- and vice-versa. This was epitomized on the morning after the Reunion as the U.S. contingent was climbing on a bus for a tour of western Ireland. Kathleen, of course, had insisted on being there to see us off. As the bus pulled away from the Downhill House Hotel, the last thing we all saw was Kathleen waving goodbye to us with her handkerchief. I didn't capture that moment in a photo but I can still see it in my mind's eye as I type these words. In the years which followed, we continued to stay in touch, but it was mostly by email (Kathleen was very good with email into her 90's!) She would often ask when Marilynn and I would return for another visit. Sadly, we only managed to get back to England twice -- once during a week long vacation in 2009 (when the photo at the top of the post was taken) and again in 2015 when we attended Maire Davies' 70th birthday party. It was during the 2015 visit that we had the pleasure of meeting Bridie Simkins, a woman whom Kathleen called "my best friend". Marilynn and I had brought some gin and tonic with us as Bridie had told us that it was Kathleen's favorite drink. We spent a lovely evening with Kathleen at Bridie and Ernie's house but, somehow, forgot to drink a gin and tonic! 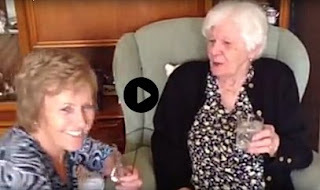 After we returned to the States, Bridie sent us a short video of Kathleen. I think it's fitting to end this memorial to Kathleen by clicking on the link below and hearing a few words from Kathleen herself -- sitting around with her best friend while enjoying a gin and tonic. 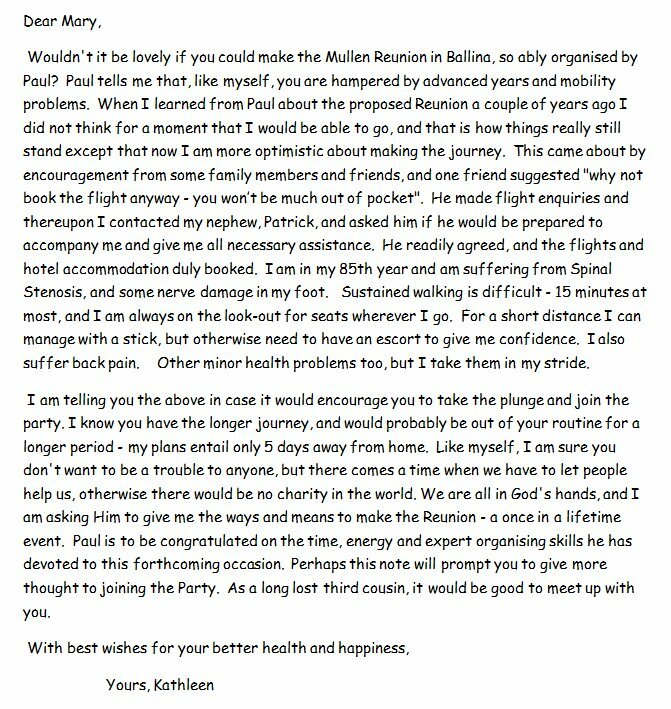 Wonderful tribute to Kathleen Duffy, Paul. It was great to to reminisce about the Mullen Family Reunion in Ballina. What as special event that was. I too remember Kathleen waving to us with her handkerchief as our bus pulled away! I especially loved her video to you and Marilynn! Very touching. She was very special woman and will be missed by many.